Minister of Defense, Minister of Military Production, Commander-in-Chief of the Armed Forces (until 2012). He was Chairman of the Supreme Council of the Armed Forces from February 2011 – August 2012. In his time as defense minister, Tantawi resisted pressure from the United States to reform American military assistance away from prestige military hardware (such as tanks, fighter aircraft, and helicopters) and toward equipping and training Egyptian forces for counterinsurgency and border patrol. In a 2010 cable to U.S. Chairman of the Joint Chiefs of Staff Adm. Michael Mullen, staff at the U.S. embassy in Cairo described Tantawi as “one of our chief impediments to transforming our security relationship” and urged Mullen to “encourage Tantawi to place greater emphasis on countering asymmetric threats rather than focusing almost exclusively on conventional force” in his upcoming visit to Egypt. Several cables from 2008 carry similar messages. In one, Amb. Francis Ricciardone says the United States “should urge Minister Tantawi towards a broader and more flexible partnership based on shared strategic objectives, including border security, counter-terrorism, peacekeeping and civil defense.” Though a cable from that year summarizing a meeting with Tantawi and U.S. officials indicates that Tantawi was sympathetic to border control issues, the Egyptian military’s lack of reform toward anti-terror and anti-smuggling policies continued. Tantawi was given the additional title of deputy prime minister in Hosni Mubarak’s last cabinet reshuffle on January 29, 2011. 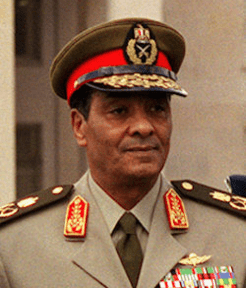 When Mubarak resigned, SCAF assumed control of the nation. A deadly August 2012 terrorist attack against a military checkpoint in North Sinai generated a significant groundswell of anger against the Egyptian military leadership domestically, and President Morsi used this opportunity to significantly reshape the senior military leadership. Tantawi and Sami Enan—the Chief of Staff and Vice-Chair of SCAF—were made to resign, along with the heads of each of the military service branches. Former Director of Military Intelligence General Abdel Fattah al-Sisi was appointed as minister of defense and commander-in-chief of the armed forces, and Major General Sedki Sobhi, formerly head of the Third Field Army, was made chief of staff of the armed forces. All of the removed officers received jobs elsewhere in the government, but despite being named a presidential adviser, Tantawi quietly receded from public life. After the January 25 Revolution, the military decided to confront criminal and insurgent activity. The military launched “Operation Eagle” in August 2011, deploying approximately 2,500 soldiers and 250 armored vehicles to North Sinai. A number of suspected militants were arrested, and the operation was eventually approved by the Israeli government; however, the killing of two apparently innocent locals sparked Bedouin discontent, leading to protests. Israel further allowed an increased number of Egyptian troops into the region in October 2011. In addition to the unrest that plagued Sinai during SCAF’s seventeen months in power, the military government also had to contend with protests in major urban areas, which were often met with violence. Notable incidents of brutality from the security forces include the Maspero massacre in October 2011 and the clashes at Mohammed Mahmoud Street and the Cabinet building in November and December. In June 2012, Muhammad Morsi was elected president of Egypt, and Tantawi and SCAF handed executive authority to a civilian president for the first time in Egyptian history (though not before reserving rights to themselves in a constitutional declaration). Tantawi remained minister of defense and chair of SCAF. In August 2012, a group of gunmen attacked an Egyptian army base in North Sinai, killing at least fifteen soldiers and stealing vehicles and attacking an Israeli border post. The Israelis successfully repelled the attack and killed at least six of the attackers.